When we went to Spain we were expecting to get our fill of tapas, but one thing we were not expecting were the proliferation of tea salons! We are major tea lovers here at ETW, so we were delighted to learn about a genre of tea rooms found only in Andalusia: teterias. These are Moroccan-style tearooms influenced by the many centuries of Islamic rule when Spain was known as Al-Andalus. Teterias are found throughout Andalusia, and we were lucky enough to try them in both Cordoba and Granada. In Cordoba we visited the Salon de Té (Calle Buen Pastor, 13, 14003 Córdoba, Spain), a stone’s throw from the Mezquita. In Granada we stopped at La Teteria Del Banuelo (Calle Banuelo 5, 18010 Granada, Spain), in the shadow of the Alhambra. The inside of a teteria is typically done in a Moroccan style, with an atmospheric courtyard filled with North African-style furnishings and pillows. Mint tea is always a good bet at the teteria, though the tea offerings are usually much more extensive; at some places you can even get smoothies and Mediterranean munchies. Another great aspect of the teteria are the little Moroccan pastries on offer, which transported us to the Djemaa al Fna. I was impressed by the tea selections at the Salon de Té, with pages and pages of both hot and cold varieties. M got an almond shake, while I sampled an iced rooibos tea with berries. Our friend K fought through the heat and got a beautifully-presented mint tea with tons of fresh mint. At the Salon, we sampled baklava, kunefe (birdsnest pastries), tiny turnovers with pistachios, and makrout; you can get savory dishes as well if you are feeling peckish. Banuelo had a smaller selection of teas and savories, but offered sweet crepes along with a similar selection of Moroccan petit fours. Lemonade with mint and an iced coffee was a perfect selection for a particularly hot day at Banuelo, though the mint tea was still beautiful and refreshing. Banuelo also boasted a cute outdoor seating area, though it was too hot to venture outside on the day we visited. Visiting these teterias was a highlight of our visits to Andalusia, and they definitely transported us to another era of Spain’s history. Whether you are looking to hide out from the punishing sun, or get some munchies, when you are in Andalusia you have to make sure to stop by a teteria for the full experience. The Langham hotel in Chicago has quite a few things going for it, not only is it located in an iconic Mies van der Rohe skyscraper, it has also been named the top hotel in the US by TripAdvisor. 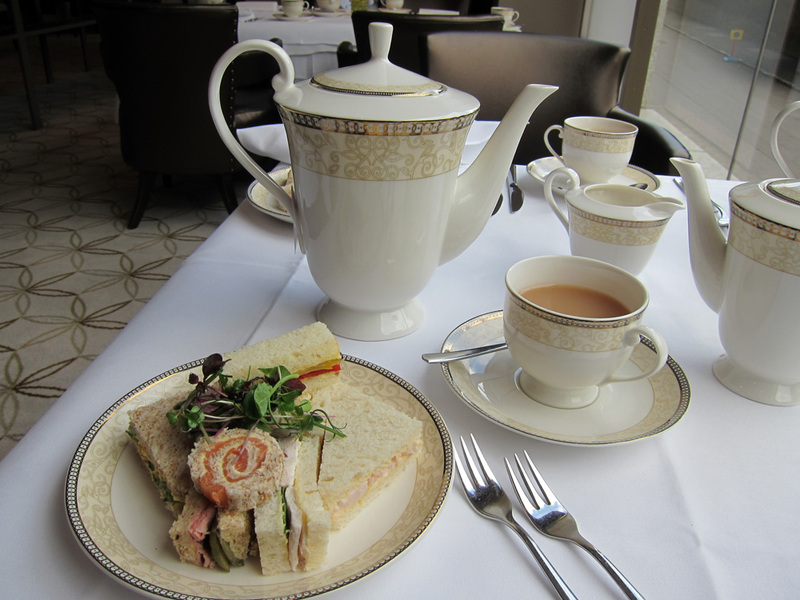 When we were researching the top afternoon teas in Chicago, one name that came up repeatedly was the Langham. 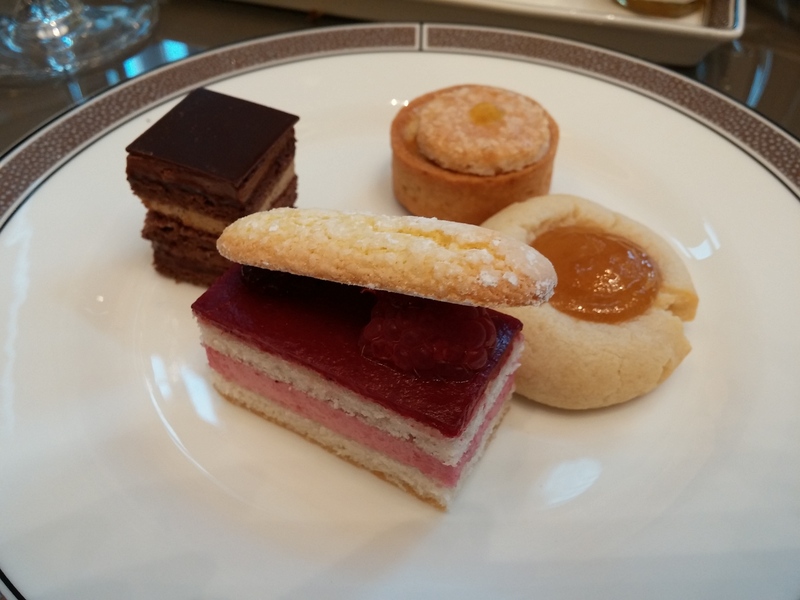 We figured the British pedigree of the Langham name wouldn’t hurt either for an excellent afternoon tea experience. 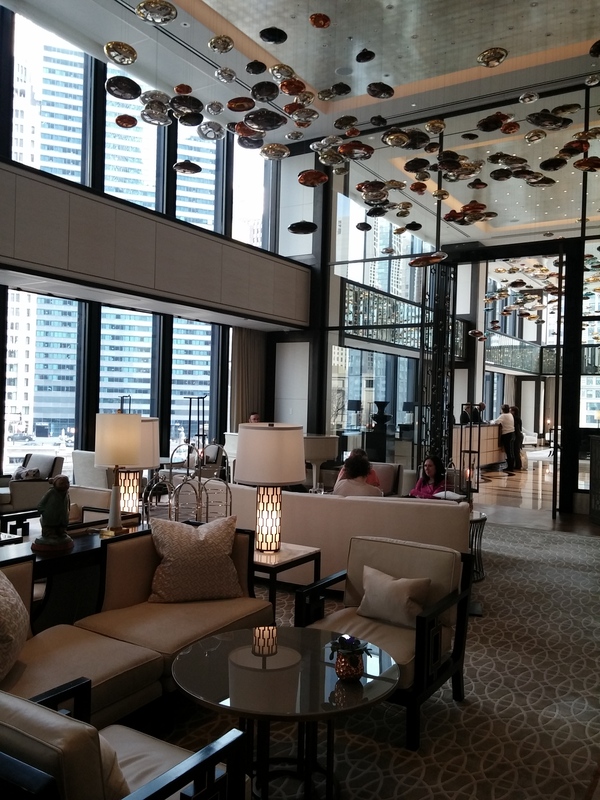 The setting for tea in the Langham’s Pavilion (330 N Wabash Ave, Chicago, IL) was absolutely gorgeous, and was a stunning mix of classic and contemporary design in black and white. And if you looked up, there is even a constellation of shiny metallic sculptures floating overhead, giving an ethereal effect. A pianist on a white grand piano added to the ambiance, and kudos to him for playing instrumental covers of Sam Smith and Adele. We were seated at a table for four, with comfy white leather chairs and sofas, and a little vase of violets. The view over the Chicago river, wasn’t bad either. Our enthusiastic server introduced us to the tea selection, and we were pleased to learn that we each got two teapots, to be brought out subsequently. There were a wide variety of teas for all palates: vanilla rooibos, “English Flower” rose and chamomile infusion, Moroccan mint, Black tea with Peach and Marigold flowers, Sencha and Darjeeling. There was also a special reserve tea on the menu (which changes every few months) – the Wedgwood blend – which was a blend of Indian and Kenyan black teas. It was described by our server as being closer to coffee in flavor, with a malty taste (intrigued, at least one of us had to get it). 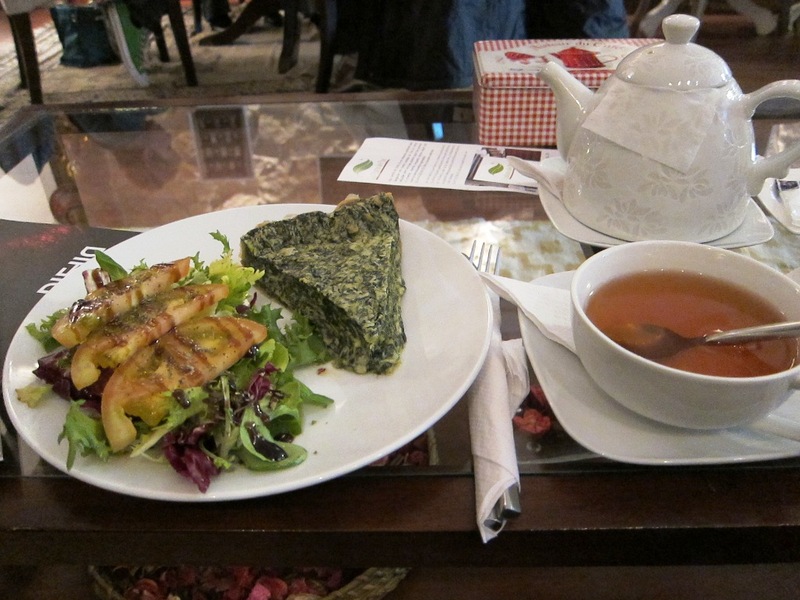 After our tea orders had been taken, our four little savory items were brought out on a separate plate. 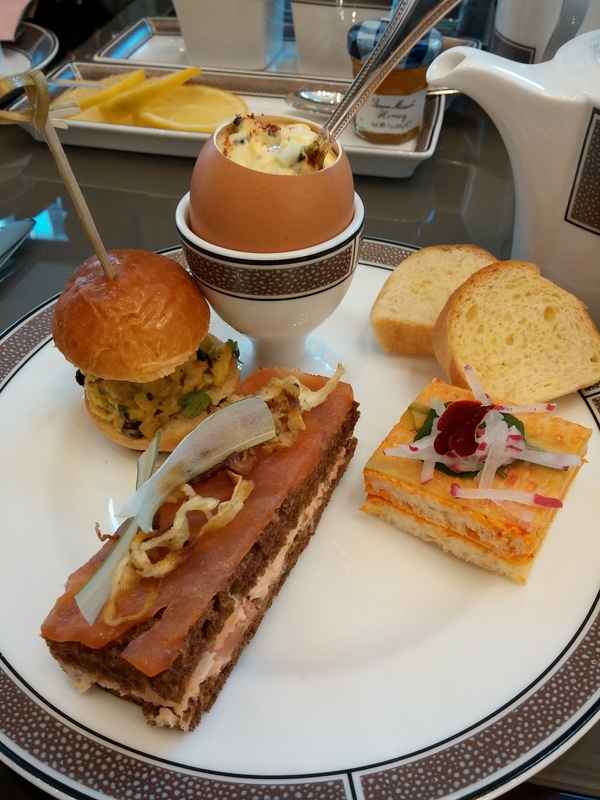 The selections of the day were: “Coronation” chicken salad on a mini brioche roll, Cucumber, watercress and piquillo pepper sandwich, Smoked salmon rillette, and truffled egg salad. All of these dishes were a cut above, and we liked that each had a unique spin on the typical crustless tea sandwich. A standout was the egg salad, which was served in an eggshell! Everything was delicious and well presented, and had us ready for “dessert.” Each person received an individual pot of tea, with an adorable accompaniment of mini pots of honey. In keeping with the attention to detail, the tea serving was made custom for the Langham itself. 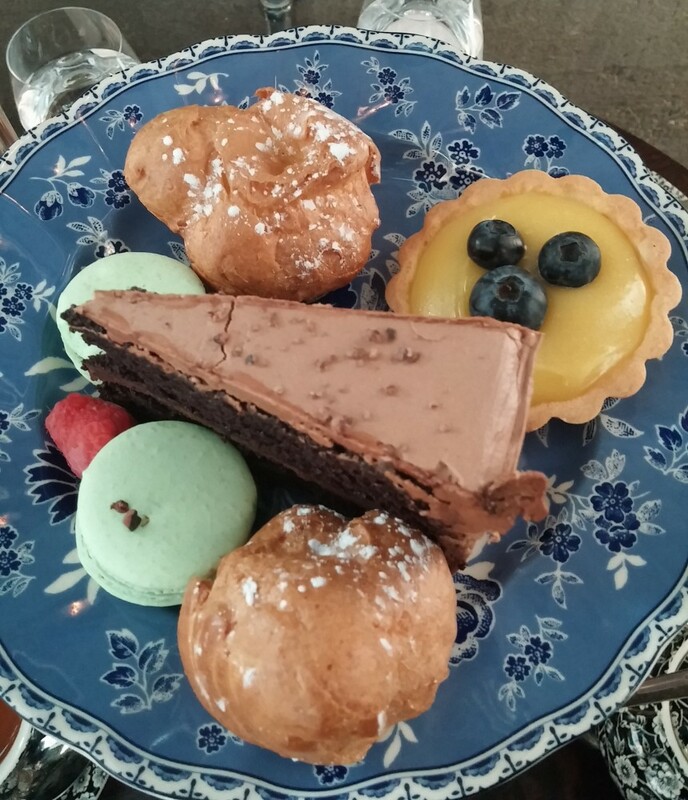 Next, came the tiered serving tray – also in signature Langham china – with four tiny, elegant pastries and two scones apiece. The two scones, raisin Earl Grey and plain, which were hot out of the oven, and each came with little pots of Devonshire cream and homemade blueberry jam. The scones were light and flaky, and were an absolute dream, especially with the clotted cream, which we devoured. The four little pastries were also adorable: “Queen’s Perfection” chocolate cinnamon cake, raspberry Charlotte Russe, a shortbread citrus cookie, and almond and coconut “Manchester” tart with cherry. The multi-layered chocolate cake and Charlotte Russe were particularly stunning and delicious. The thing with teatime, it always looks like there are measly little portions of delicate food, but by the time you get to the end, you are completely stuffed. The scones put us over the edge hunger-wise, so we were unable to finish all of the petit fours, but the few we had left were just as good that evening. Fortunately, you can get your extra treats boxed up to go. And lest we forget, the tea itself was delicious, the Wedgwood blend was a favorite, as was the sweeter vanilla rooibos. We also appreciated that the server brought out the unflavored black teas with our savory dishes, and more flowery or flavored teas with the dessert. The bright-pink, rose tea (pictured above) was a perfect accompaniment to the sweets. 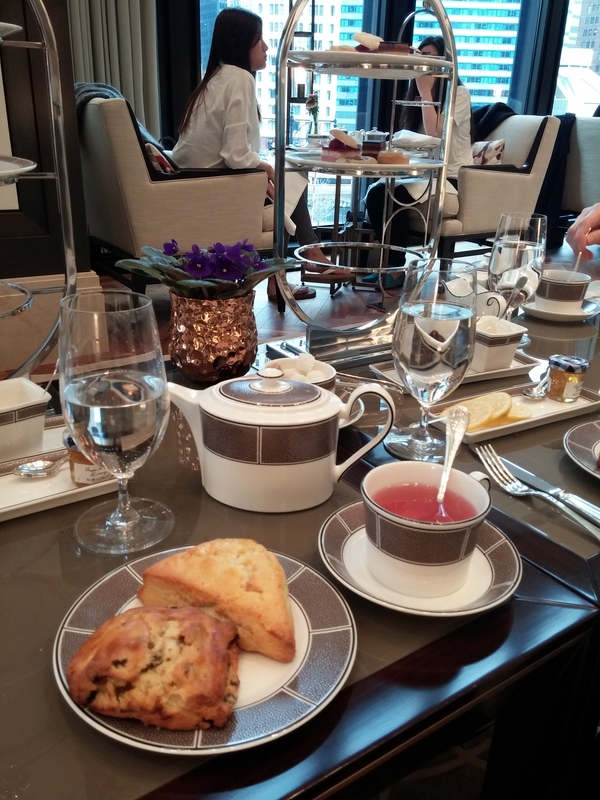 Throughout the entire teatime, the attention to detail at the Langham was impeccable. 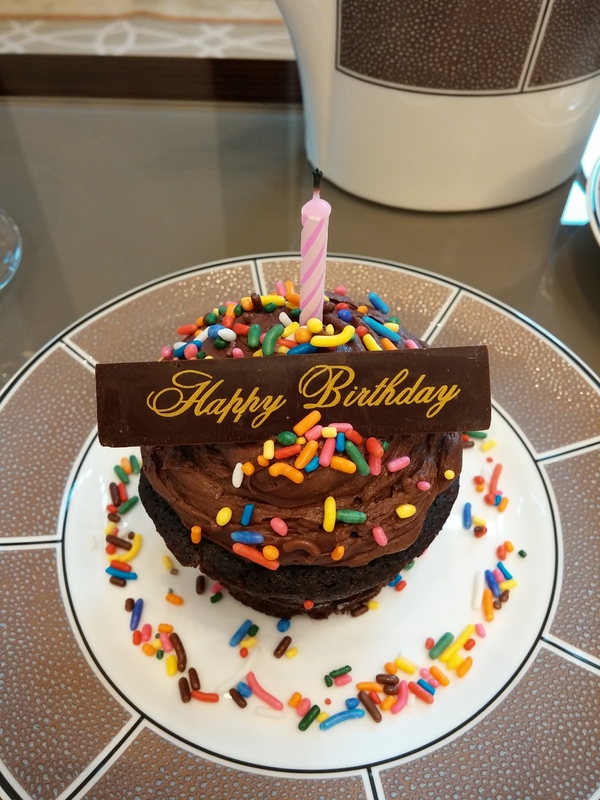 We were celebrating a birthday, and because we mentioned the special event, we got an extra chocolate cupcake with a candle, and some chocolate bars for the birthday girl to take home. 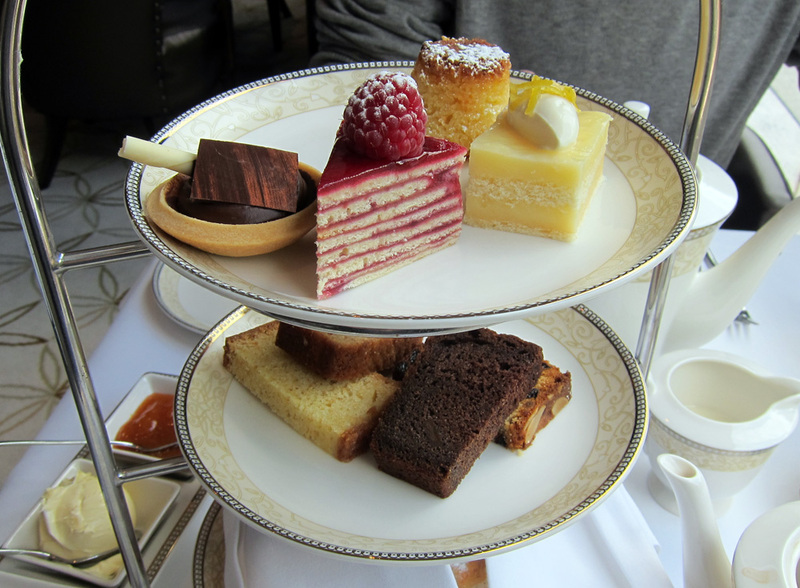 Though expensive ($50 apiece) we really felt that the afternoon tea at the Langham was a worthwhile, special experience. The service, food and atmosphere were all superb. 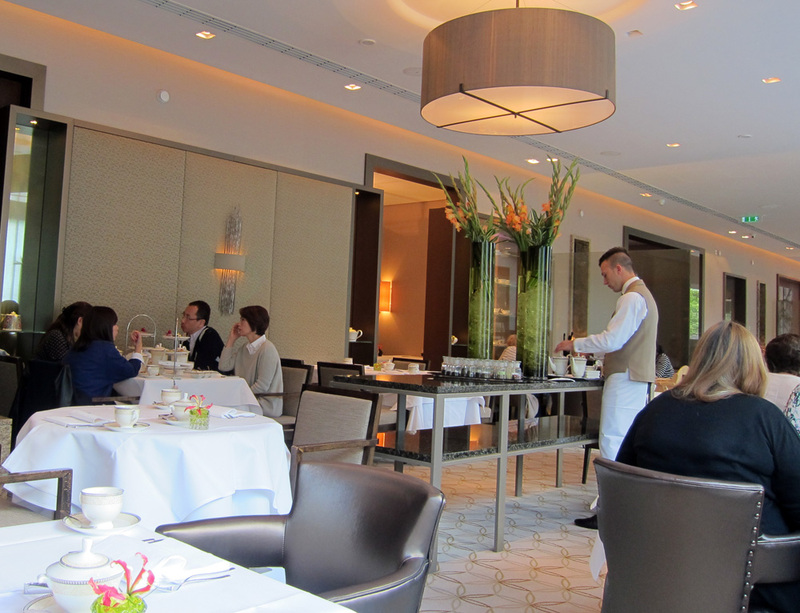 If you are looking for a refined tea with all the trimmings, definitely visit the Langham. What is Tibetan Butter Tea? We first encountered Tibetan butter tea at the now-closed Taste of Tibet in downtown Madison, WI. We consider ourselves adventurous eaters, so along with the stews and dumplings, we decided to try the national drink of Tibet – po cha or Tibetan butter tea. True to the name, this tea is strongly buttery – but what you may not expect is that it is also a bit salty and sour. We have had salty, creamy drinks before, like ayran in Turkey, but never one like this! It is simple enough to make, with strong black tea and a pat or two of butter (often Yak butter in Tibet), which is then mixed to give a frothy texture. 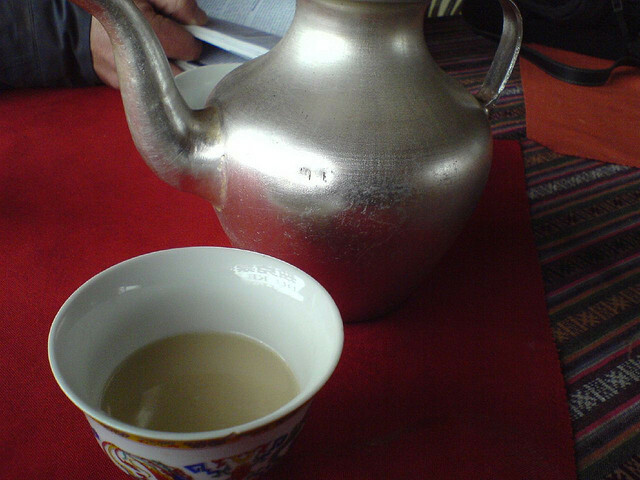 This rich drink is a staple of the Tibetan breakfast, and seems pretty similar to the trend for “Bulletproof coffee” or coffee with butter. Maybe Tibetan butter tea is the original bulletproof drink? 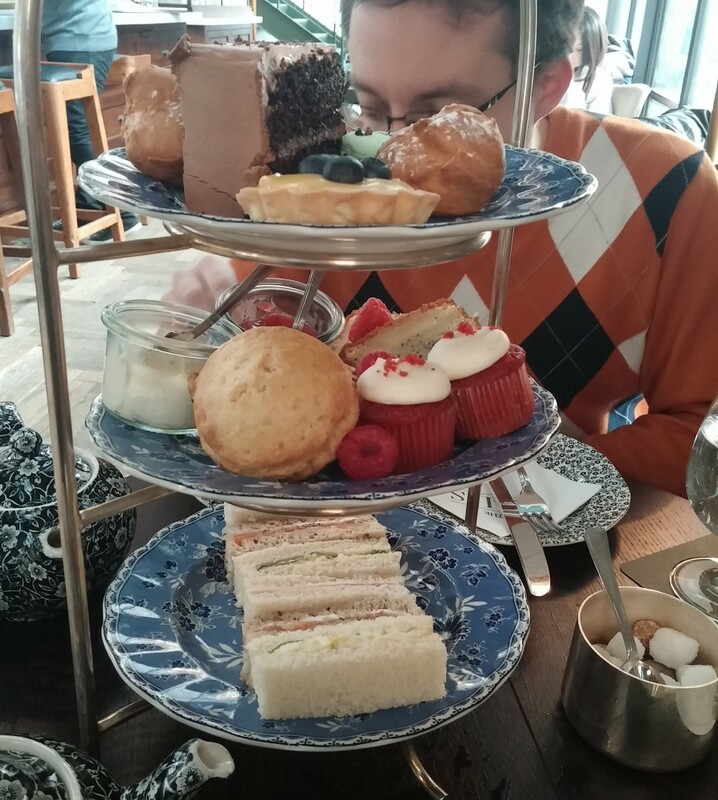 Tea in London is serious business, as you may imagine. We went to the big name tea stores, but often felt they were more flash than substance. However, Postcard Teas (9 Dering St, London W1S 1AG) is the perfectly understated answer to the glitzy superstore. Postcard Teas’ stock in trade is in providing a curated variety of teas from small tea farms all over the world. Now these are really small farms, less than 15 acres. Postcard Teas is tucked away on a side street right off of the hustle and bustle of Oxford street. The store is truly an oasis of calm, and is very beautifully arranged with 60 tea varieties in cute tins alongside an assortment elegant handmade teapots from Japan. Taking up one wall of the store are all of the tea varieties available. The 60 teas available at Postcard Teas range in type and price from tiny tea estates throughout Japan, China, India, Vietnam, Taiwan and Korea. Most of the teas are black, oolong and green, but there are also purh-eh and flavored teas. The choice is almost overwhelming, but the staff is very friendly and knowledgeable. Even for such specialized teas, the cost is pretty reasonable. We also appreciated the nice artwork on all of the tea ins, which each come with information about the provenance of the teas and brewing instructions. The amount of care that Postcard Teas puts into informing its customers about tea is very apparent – they even offer classes! You can pay to sample any of the teas (£2), but the fee is waived if you end up purchasing the tea itself. This is not just dipping a teabag into some boiling water though. Each tea has a specified steeping time and temperature and the gentleman who helped us at the store prepared our tiny cups of tea with the precision of a surgeon. 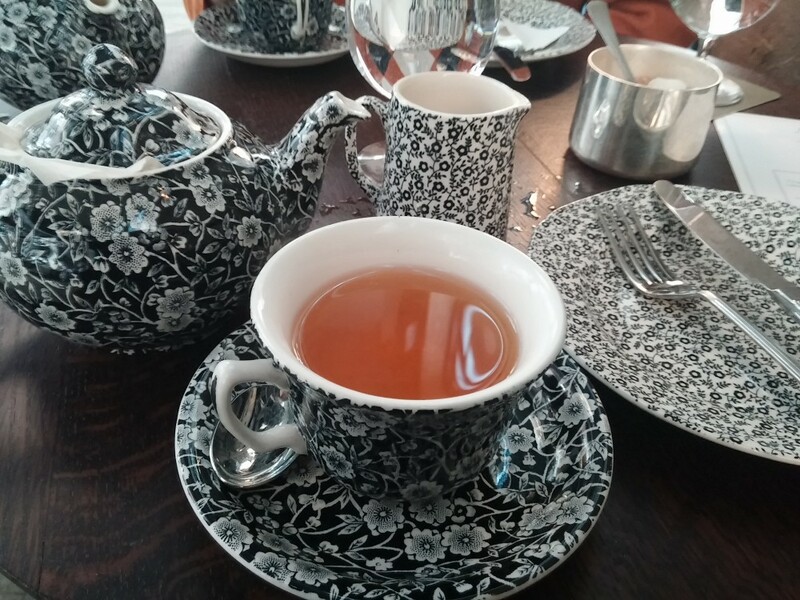 We sampled the rich English breakfast tea that is a mix of Indian, Japanese and Chinese teas. We also tried a delicate Darjeeling from the Mineral Spring Tea Farm in Darjeeling, India. We really liked both of our choices, and it was remarkable how different each was (Darjeeling is on the left, English breakfast on the right). The coolest aspect is that you can actually send a “tea postcard” (£8.95-12.50). You can select from one of their tea varieties and put it in a special envelope and mail it directly from a little red postbox right in the store, to pretty much any location. You pay the extra for postage and they take care of the rest for you. We sent ourselves the tea postcards and a few weeks later they arrived – what a nice souvenir! We would highly recommend Postcard Teas to any tea lover visiting London, they truly promote the very best of global tea culture. We write a lot about food on this blog, but we don’t often touch on the design experience related to dining. When it comes down to it – there is a lot of design involved in every step of the eating experience – from the restaurant/kitchen, the table setting, right down to the shape of a teacup. Fast Company has an interesting piece by John Brownlee about what role design plays in the Turkish tea experience in particular. Nothing is more refreshing on a hot summer day than iced tea. Tea (in its many forms) is one of the most universal drinks, whether in hot or iced form, so why not give the Snapple and Lipton a rest and try something new? Even though the end of summer is sadly approaching, there are still plenty of hot days to enjoy some cool drinks (preferably on a balcony or beach). You can’t have a proper pastry time in Lisbon without coffee or tea. So for the Portuguese Pastry post-doc, what could be more appropriate than a Portuguese tea to accompany some sweet snacks? Gorreana tea, from the Azores, is not only the Portuguese-grown tea, it is the only commercially-produced tea grown in Europe. 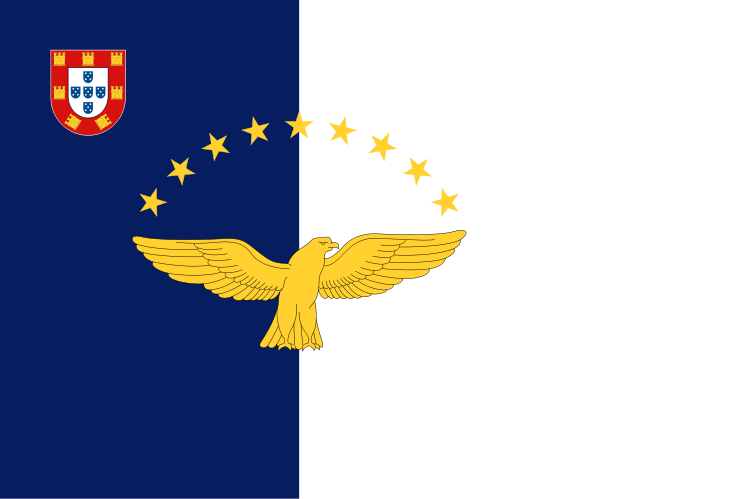 The plantation was founded on the Ilha de São Miguel in 1883. According to their Portugese wikipedia page, tea was brought to the island by Macanese technicians in the 1870s, after it was decided that the mild Azorean climate would be perfect for tea production. Currently, Gorreana produces Green Tea, Orange Pekoe tea, Black tea and broken leaf tea. With our latest trip to Lisbon we figured out the way to truly enjoy ourselves is to go to cafes. One of the best and most inviting cafes we have encountered recently is Cultura do Chá (“Tea Culture”). Set back in a tiny alley in Chiado, Cultura do Chá is directly across from a giant bougainvillea tree – a red bicycle marks the entrance- you can’t miss it. 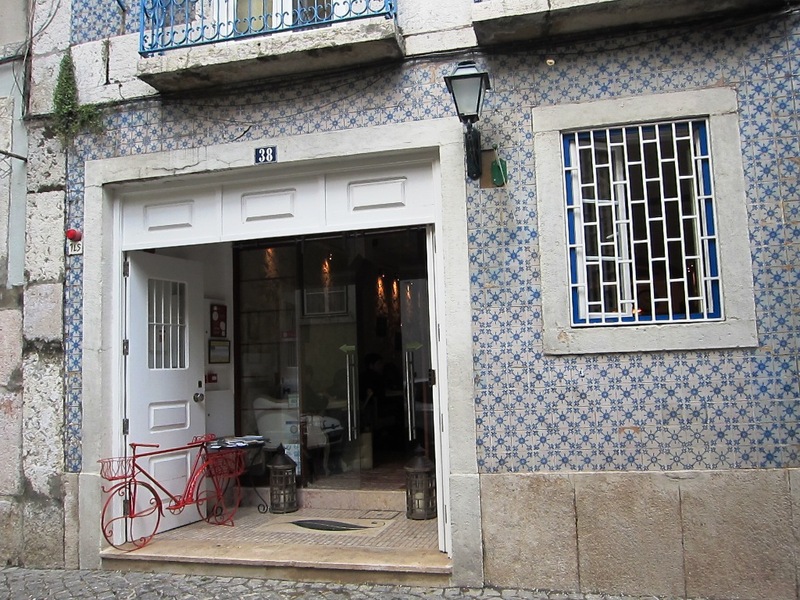 Cultura do Chá is a small cafe, set in an old stone building covered with azulejos. This interior has stone walls and is full of nice antiques and artfully mismatched tables. Randomly, they also had the nicest bathrooms we have ever seen in a cafe – done with Asian inspired screens and even real towels. You really have to see it to understand. After some initial confusion about the ordering process – find a seat? order at the counter? 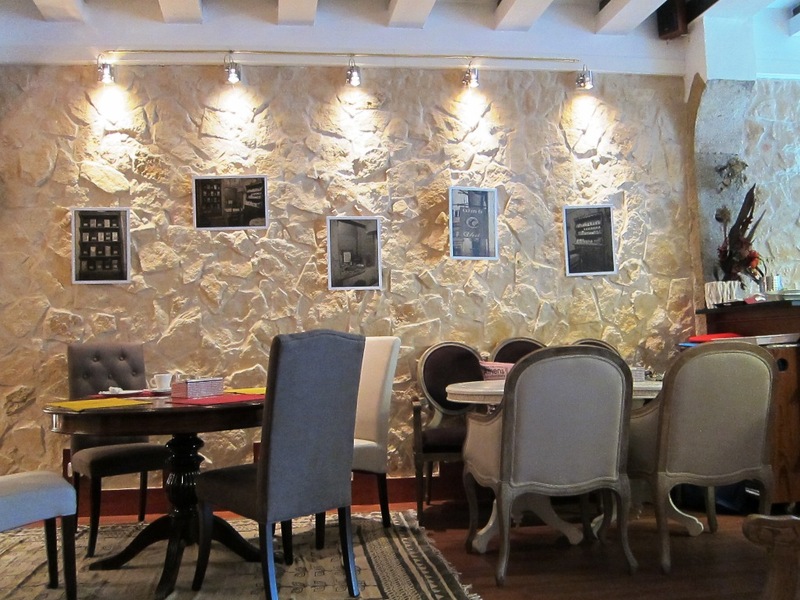 – we were directed to sit, on a lovely comfy couch, where we relaxingly perused a slate of Lisbon cultural magazines while waiting for the cafe’s lone server. 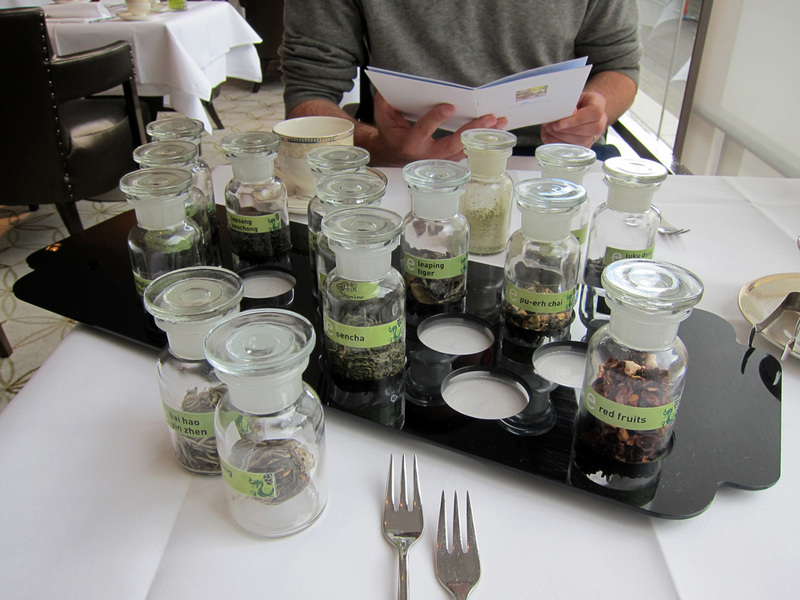 The menu revealed the cafe’s focus on tea – you can get 30 varieties of tea, each for 1 or 2 people. We ordered a pot of tea for 2 (5€) of loose-leaf chocolate hazelnut tea. Kudos to presentation: cloth napkins, nice flatware, and a classy set of ceramic teapot and plates, which we not-so-secretly wanted to take home with us. We were also a fan of the cups: wide-brimmed and flat like a soup bowl, we actually found them very easy to manage and better at cooling the piping-hot tea so we could drink it sooner. After tea, we looked at their small lunch menu of crepes, salads and sandwiches all for less than about 7 euros. L ordered the spinach quiche (4€) and M got a chicken sandwich (4€) with apple and balsamic vinegar (maybe some cinnamon, too?). Both came with a really nice and salad, simply dressed, but super-fresh. Both the quiche and the sandwich were larger than we expected for the price, and completely delicious. To top off your meal, there are some delectable looking cakes in the window. 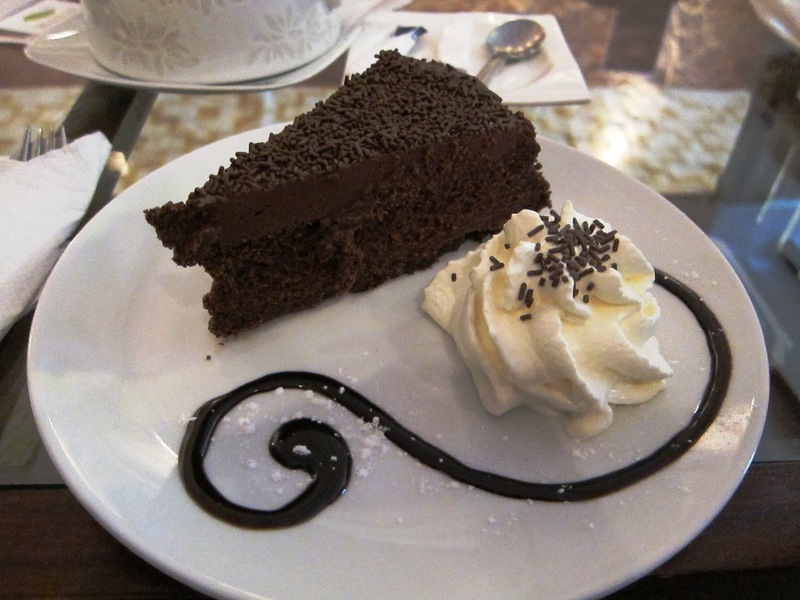 Naturally, we partook in a large piece of chocolate cake, which came out in a surprisingly elegant presentation: house-made whip cream, and an artful swirl of chocolate sauce. Service was friendly, though at a leisurely pace, so prepare to savor your meal. Even at the somewhat late hour of 2 PM, the cafe was full of happy expats and Lisboetas alike enjoying a leisurely tea, and we agree that it seems like the perfect place for relaxation on a busy day. We will definitely be back: after all, we have 29 more varieties of tea to sample. While the bakery scene in Lisbon may be dominated by classic cafes with gilded mirrors and eggy pastries, there is another breed of cafe cropping up in trendier areas of Lisbon, one more in line with contemporary culinary trends and tastes. One such shop is Tease, Lisbon’s go-to spot for cupcakes. Tease is located in the Chiado neighborhood of Lisbon, home to many of Lisbon’s newest clubs. Tease is the brainchild of architect Sónia Millard and you can tell that every detail has been carefully considered. The interior of Tease is eclectic, with a mishmash of velvet armchairs, antique china and cool wall art. The glass bakery case was full of cupcakes, and there was also a variety of other baked goods and coffee drinks on offer. 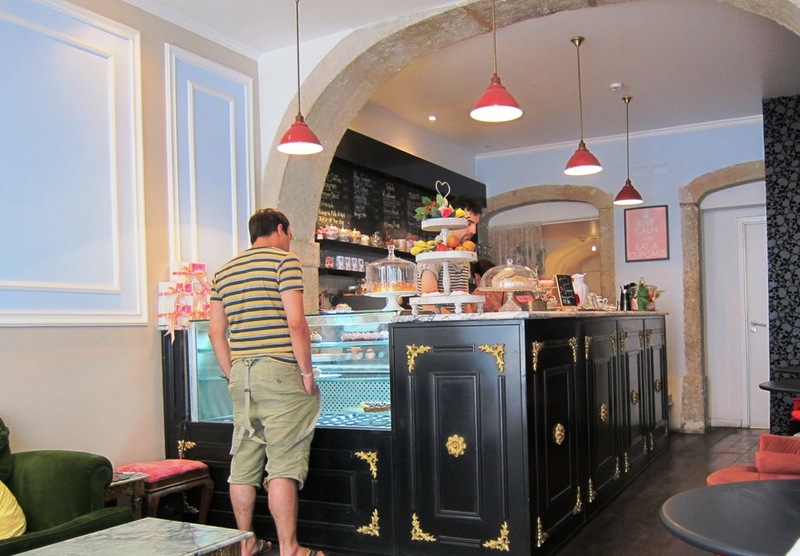 Like many of the newer cafes in Lisbon, Tease also offers a complete brunch and afternoon tea. However, the main reason to visit Tease is for the cupcakes. Each large cupcake was 2.40€, and miniature cupcakes are 1.00€. The day we visited, the cupcake assortment included red velvet, vanilla, fresh strawberry, cookies and cream, lemon poppyseed, among others. 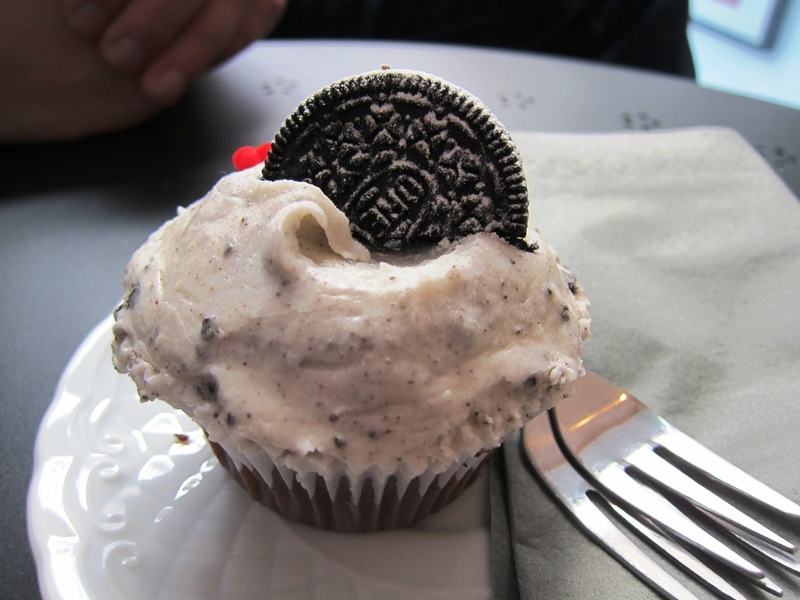 We ordered a cookies and cream cupcake, chocolate cake, which came topped with cookies and cream icing and an oreo. We were not expecting much (we are not too into cupcake bakeries as a rule) – but the cupcake was actually quite delicious. 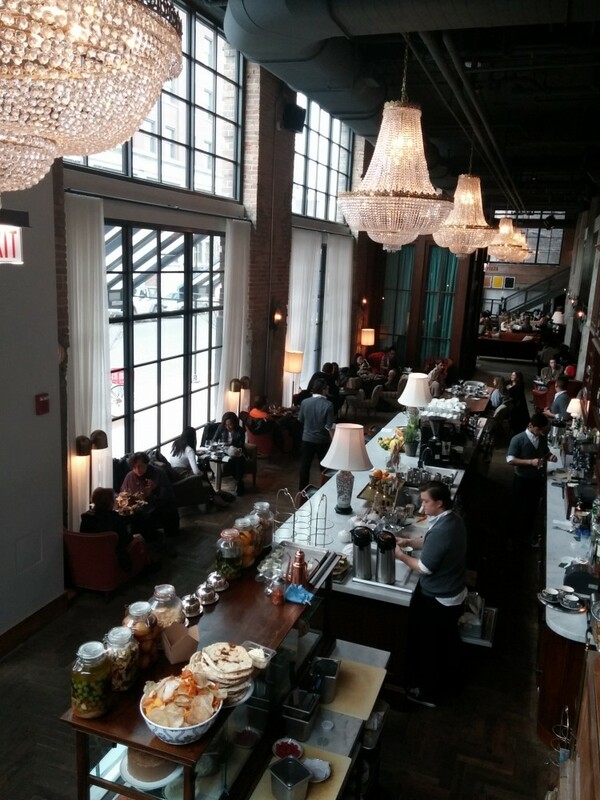 We loved the eclectic decor of Tease, the friendly service and the cute outdoor seating area. We would definitely recommend Tease to visitors and Lisboetas alike who are maxed-out on Pasteis de Nata. We love Thai iced teas stateside and were pleased to learn that they actually are popular in Thailand as well (unlike some other of our favorite Thai dishes). Thai Iced teas are called “Chaa Yen” in Thai which literally means “Tea Iced.” Haphazardly we found out that by ordering a cha yen flavored smoothie at an Au Bon Pain outside the Grand Palace (not our finest culinary moment). A typical Chaa Yen is an uber-sweet, red, spiced Thai tea with condensed milk. 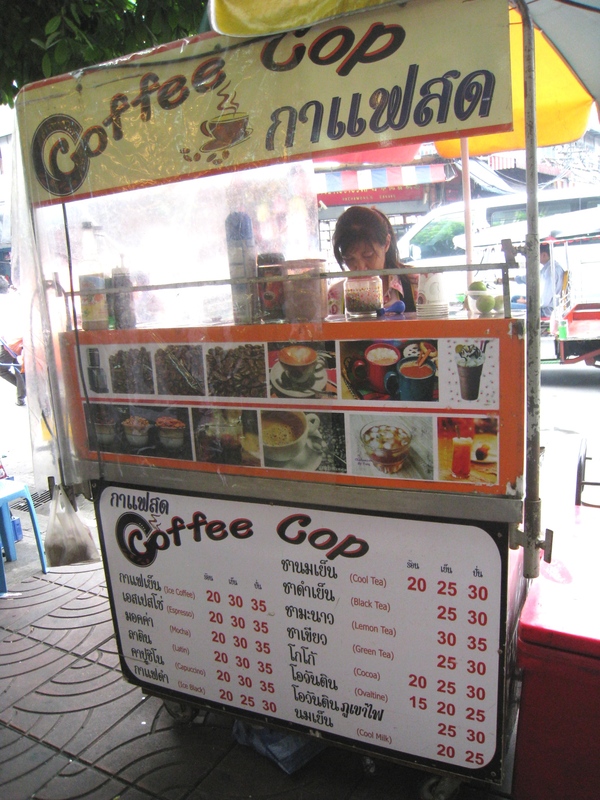 The best Thai iced tea we had was in Chinatown in Bangkok from a mobile coffee stand called Coffee Cop on Rachawongse. The proprietor could not be nicer and the Chaa Yen was amazing! Back home, we have tried to recreate the recipe, with varying success. Thai tea is somewhat difficult to get in the US, so we have had some luck using Vanilla-flavored Rooibos instead. I’m a regular reader of Lifehacker and recently they’re had a spate of interesting articles about Tea. Check out RateTea for reviews of literally hundreds of types of tea, or check out Steepster, a site with tea information, reviews and even blogs. Or if you’re feeling particularly crafty you can even make your own DiY travel tea bags. Sweet Tea is the most southern of drinks. On the surface it’s just a standard iced tea chock full of sugar. However, south of the Mason Dixon line it’s a cultural institution. Slate’s Jeffrey Klineman’s notes: “For me, personally—and I suspect I’m not alone—sweet tea is a primal link to my own Southern past.” Tea has a long history in the south, and South Carolina was the first place in America that tea was grown. Recipes for “Sweet Tea” date from the late 1800s, but the recipes called for green tea. 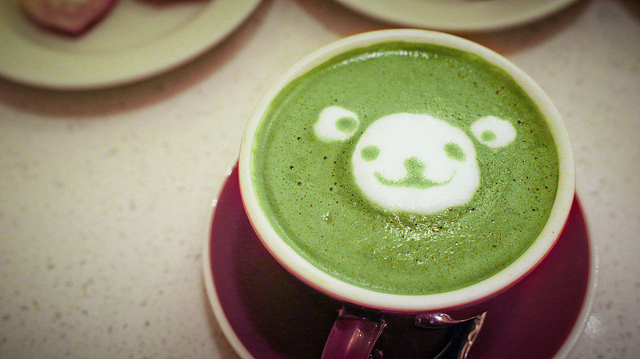 A little known fact is that green tea was once more popular than black tea in the US. Black Tea did not become the most consumed variety until after World War II. Luzianne Iced Tea is currently one of the most popular brands and we saw giant carafes of Luzianne in many of the restaurants we ate at on our trip. On the road, our sweet tea of choice came from the prolific southern chain, Bojangles, which you can find throughout the Southern states. We’re not going to lie, we are drawn to nice food packaging designs. Of course this extends to one of our passions, tea, as well. If you’re perusing though the aisles of any Chinese grocery story or specialty store you’ll usually be able to find some nicely packaged teas in appealing tins of all shapes and sizes. So when we went to the Chinese gift emporium Pearl River Market in NYC (477 Broadway, between Grand St. and Broom St. in Soho) we thought we must have hit the jackpot. Pearl River is a veritable pantheon of garish, fun and colorful tea tins. Some of the showiest tins, with something of a retro flair, come from a Hong Kong company called Guang Sang Tea (which also goes by the imprint Roland). If you’re not in NYC, you can peruse the selection of tea tins at Pearl River online. The Roland vanilla tea tin at left is one of our favorites.